Many organizations focus on task-related skills and problem-solving when developing their online training strategy. However, teamwork skills in online training programs tend to be overlooked. The simple truth is that EVERY staff member should be able to lead as well as to follow, which requires effective communication, conflict resolution, and creative thinking skills. Here are 5 ways that you can turn your employees into a cohesive corporate eLearning team that can take on any challenge. Create online discussion groups to build active listening skills. Corporate learners must be able to share feedback, address their concerns, and talk about their experiences. This can be a challenging feat if they are part of a distributed workforce with no physical meeting space. However, there are a variety of different platforms your employees can use to spark discussions online, such as social media sites, blogs, and forums. Create a LinkedIn or Facebook group and invite your corporate learners to join. You can even form smaller groups to make them more comfortable, which is essential for employees who may be introverted or not familiar with tech chat tools. Video conferencing platforms are also a great idea for groups that may require more interaction. Collaborative group activities give employees the opportunity to work together to achieve a common goal. Ask your corporate learners to create a blog that focuses on a specific topic, or a video presentation that delves into a work-related task. Just make sure that they have the tools they need to get the job done and a framework to follow. For example, set some ground rules that they can use to resolve conflict and streamline the work process. Collaborative group activities allow them to benefit from the experience and skills of their peers while building communication and teamwork skills in online training. They can share their creativity and use their collective brain power to overcome obstacles. Encourage them to assign a team leader who can keep the group on topic and focused. Integrate simulations that focus on conflict resolution. One of the most difficult aspects of working with a team is that conflicts may arise. Whether there is an argument, a difference of opinion, or just someone who doesn't mesh with the group, every employee needs to be able to effectively resolve conflicts. Instead of forcing your employees to engage in all-out war, which is probably not the best way to build teamwork skills in online training, you can use simulations to mimic real world challenges. Create a number of different simulations that center on various forms of conflict. For example, one situation could center on a dissatisfied customer while another deals with an angry co-worker. The employees must then diffuse the situation using all of their skills, knowledge, and available resources. They must identify the root cause of the problem, figure out how to appease all parties involved, and then put their analysis into action to resolve the issue. For maximum results, make your simulation characters and setting as realistic as possible to increase immersion. Concentrate on effective goal setting. Employees must be aware of the role they play and where the group is headed. In order to do this there must be clear goals and objectives they can set their sights on. This also allows them to see how every individual's skill sets, expertise, and experience fits into the big picture. Encourage your corporate learners to identify their goals beforehand and determine how every member of the team is going to do their part to achieve the desired outcome. Ask them to divide larger goals into more manageable sub-tasks and to specify which skills and information are involved. Each employee then has the opportunity to take care of their respective tasks, set personal milestones, and work with other group members who may be struggling. Goal setting offers them the chance to see how individuals can work together to reach a shared goal, and that everyone has unique talents and ideas to bring to the table. Foster a nurturing online learning community. In order for employees to feel comfortable working in a team, judgement and criticism must be a thing of the past. They simply won't be willing to share their thoughts or opinions with the group if they know that they will be ridiculed by their peers. For this reason, it's essential to create an online learning community that is supportive, respectful, and nurturing. Ensure that every employee gets the opportunity to voice their concerns and offer their feedback, even if their views differ from the rest of the staff. Corporate learners who are not actively participating in group discussions or activities should receive the one-on-one support they need to be fully engaged in the process. 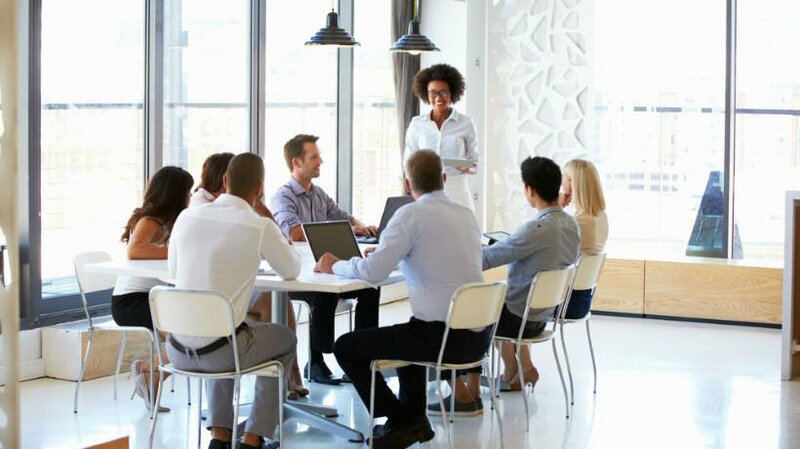 Create a set of guidelines that everyone must follow that outlines how team members will communicate and how they are expected to resolve internal issues. Above all else, provide them with a list of supplemental resources that they can use to fine tune their teamwork abilities, such as eLearning articles and videos that develop secondary skills. It's important to stress the fact that every member of your corporate eLearning team is part of a whole, that they can achieve anything if they put their collective minds together. Use these 5 tips to facilitate teamwork in your online training and motivate your employees to collaborate, communicate, and contribute to the success of your company. One of the most effective ways to build teamwork skills in online training is by offering your employees a virtual tool for their common projects. The article 10 Best Project Management Online Tools For eLearning Professionals features the best Project Management online tools that eLearning professionals may use on a regular basis, which can also be used as collaboration platforms for your staff members.